Using anonymous surfing by hiding your credentials is a safer way to browse the Internet today. VPN service provides anonymity and lets users access region restricted websites and applications from any part of the world. Fortunately, CactusVPN is a VPN application which gives the US, UK and Netherlands based IPs to allow direct access to popular location restricted websites, without causing any streaming errors. It encrypts your internet connection providing anonymous your internet identity with highest level security and no speed loss. Cactusvpn is better, faster, cheaper, and more reliable than others. It is available for Windows, Mac OS X, Ubuntu, iOS, Android, Boxee Box and DD-WRT Routers. Signup is easy, head over to the official website and enter your name and email address. 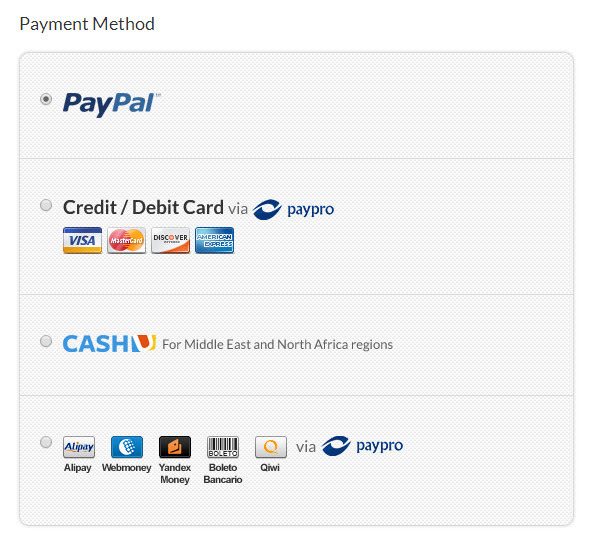 If you want to try the account, this step is enough, but if you want to purchase the service you need to enter payment options. After choosing the desired plan, you can choose the billing cycle for monthly, Quarterly, Semi-annually and annually. To use this application, you will require logging in with a free VPN trial account. In case you do not have one, you can select the “Register” option and sign up. Usually setting up a VPN connection is fairly easy in most such programs, as all you have to do is launch the app and at the most, enter your credentials and press connect button. Its user interface looks very professional, after starting it will automatically configure network settings for you. 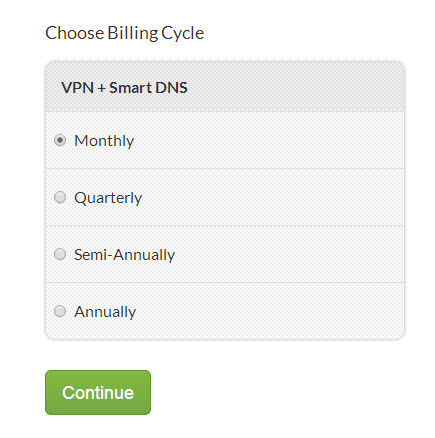 For VPN+Smart DNS account users you can select any of your desired server location using the program user interface. The main UI carries two tabs, one for VPN and other for Smart DNS. 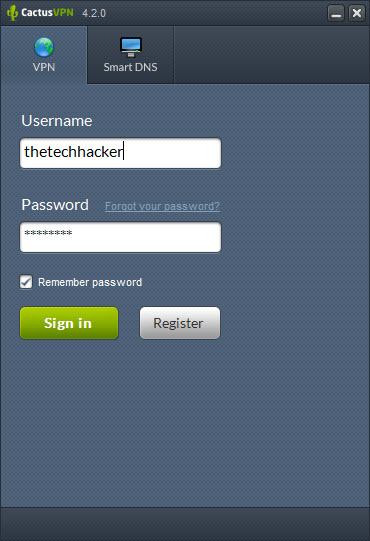 Login using your credentials and click on sign in, here you can choose the server location, city and VPN protocol. 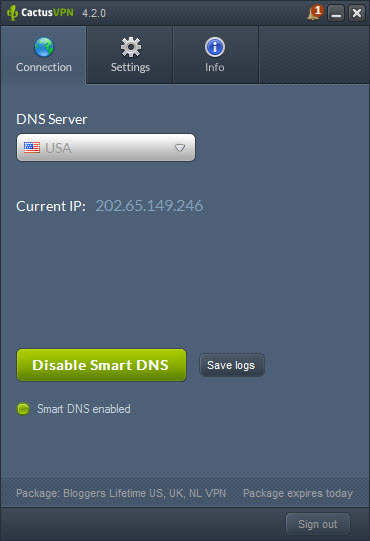 The same process is also same for Smart DNS, all you need to enter Smart DNS key in the box. 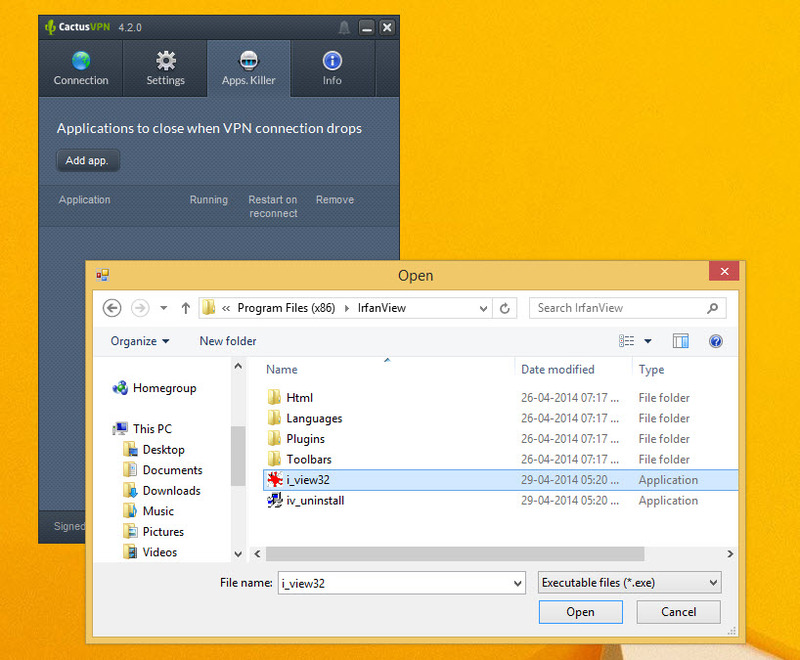 The best of the program is Apps killer option; you can close application automatically after VPN session is over. Clicking on gear icon opens the settings option. You can start up and Sign in the app when the computer starts, minimize on connect and reconnect if the connection drops. It is great service at reasonable prices. I used CactusVPN to connect to both US-based as well as international well, European servers. During testing, I found the program runs very smoothly without any disconnection problems. I was able to access popular sites and services like Netflix, Spotify, Hulu, Pandora and BBC iPlayer using both United States (US) and United Kingdom (UK) servers. 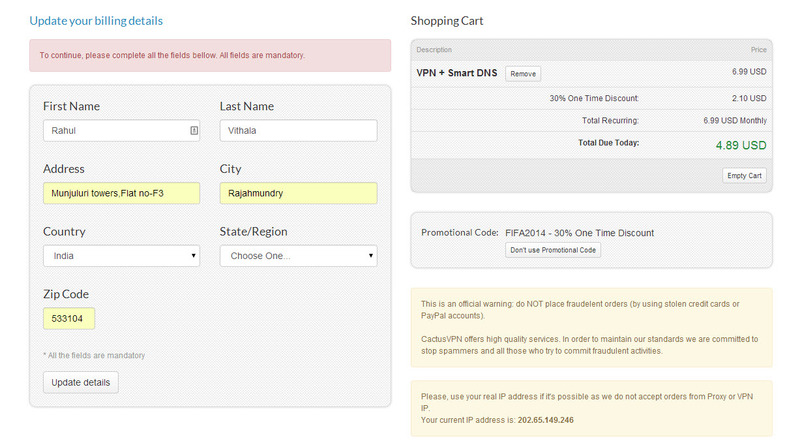 Smart DNS fakes your actual geo-location and make it look as from US and UK. Smart DNS feature is very useful to access region locked media content anywhere in the world. To measure network speed, I ran the speed tests on SpeedTest.net. I want to test the download and upload speeds by connecting different server locations and cities. Data download and upload speeds are promising, and the company provides unlimited bandwidth and speed, which is a very good combo for anonymous web users. The performance was also consistent and on the high-end in comparison with other VPN services. Using CactusVPN, you can connect up to three devices at a time using different server locations. The bonus attraction is its Auto Proxy feature, using this feature you can use proxy only for some websites like Netflix, Spotify, Hulu or BBC. And the rest of your browsing session uses your IP. Does it compare to the other providers? It is one of the promising contenders in the VPN market. For the most part, VPN services all do the same things. The difference in features and speed, it offers the best performance in reasonable price. In my point of view, CactusVPN has excellent performance and best list of features. The service is delivering solid performance; I would recommend CactusVPN for users who needs multiple devices support, best data encryption, and ultimate speeds.